Foreign trade is always increasing and all governments around the world try to protect some of their core domestic industries by applying various of restrictions to keep import at a minimum. Importation of fresh meat to Iceland is prohibited but forces with in consumers’ welfare organizations are pressuring for these restrictions to be reduced and opening the market up for foreign competition. If the market would open up then consumers would get lower prices, producers would probably have to lower their prices and production. It is crucial for the producers to appeal to consumers loyalty on Icelandic meat and prove their quality. In Iceland, like many other countries, agriculture is a significant part of history, sustainability and food security. In early 20th century agriculture started facing difficulties in which leaded to the government taking actions by subsidizing the industry. Import restrictions also protect domestic industry to this day. Geographic outlines, climate and distance from world markets cause high production cost, high transportation cost and poor terms of trade. Market conditions are often blamed for high food prices in Iceland especially because of small population and small market. This small market is therefore uneconomical in production, management and trade and the advantages of economies of scale are not possible like in other neighbouring countries of Europe for instance (Snorrason, 2006). Iceland’s participation in world trade for example in the European Economic Area (EEA) and Word Trade Organization (WTO) has opened the possibility of increased import of agriculture goods but the foreign market has not yet threatened Icelandic meat producers due to import restrictions (Þorgeirsson, Bjarnadóttir, & Sveinsson, 2004). The import restriction are in form of high tariffs, import quotas and strict import permits, several certificates and documentation confirming that the product have been stored at a temperature of at least -18°C for 30 days and a certificate confirming the that the products are free of salmonella (EFTA Surveillance Authoroty, 2014). The Icelandic Competition Authorities, Consumer Protecting Agency and other organizations have complained that the restrictions prevent healthy competition and leave consumers worse off. Recently the EFTA Surveillance Authority concluded a reasoned opinion that Iceland’s restriction on importation of fresh meat in breach of EEA law (EFTA Surveillance Authoroty, 2014). The Icelandic government argues that these restrictions are necessary for Icelandic healthcare due to possible infection to Icelandic farm animals. Iceland is an isolated island and farm animals stocks like lamb have stayed the same for decades. This means that Icelandic farm animals are much more vulnerable to diseases with worse immune system than the farm animals on the main lands of Europe. Along with these import restrictions on selected agriculture products the Icelandic government also subsidizes the agriculture industry by guaranteeing minimum price to farmers. Some have criticise that Icelandic farmers are overindulgent by the government compared to other nations and because of this farmers/producers can offer higher prices than they would in more competitive market. An oligopoly is a market with few large firms holding the majority of the market. They offer similar products but try to differentiate to be more desirable than the next. Firms in oligopoly market are said to be interdependent which mean that they will consider their own actions influenced with how the rivals might respond (Mankiw & Taylor, 2014). The Icelandic meat producers market is an oligopoly. The four largest producers of meat had 56% market share in 2010 (Icelandic Competition Authority, 2012). The market is small due to small population, which leads to uneconomic production, management and trade compared to larger countries. Price on meat was 38% lower in the EU states on average in 2009 (Kristófersson & Bjarnadóttir, 2011). Economies of scale are hard to obtain due to high capital cost, seasonal fluctuation and only the few large producers have sufficient economies of scale compared to the size of the market (Jóhannesson & Agnarsson, 2004). These facts make it harder to enter the market for new comers (entry barrier). It is important for all producers to know how consumers respond to changes in price. The price elasticity of demand measures how much the quantity demanded responds to a change in price (Mankiw & Taylor, 2014). 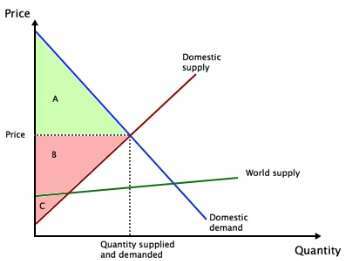 Price elasticity of goods can vary, necessities are often rather inelastic, that is, the percentage change in demand is small when prices change (PE<1). Luxuries on the other hand are elastic goods, the percentage change in demand is large when prices change (PE>1). Most agriculture products like meat are inelastic goods (although specific types of meat are elastic due to close substitutes, from pork to beef for example) as food is a necessity. Consumers maintain the consumptions of them despite changes in price (Jóhannesson & Agnarsson, 2004). Welfare economics is the study of how the allocation of resources affects economic well-being. Consumer and producer surplus is used to measure the benefits to consumers and producers of trading. When government introduces taxes, tariffs and quotas it creates a deadweight loss. Deadweight loss is the fall in total surplus that results from a market distortion such as tax (Mankiw & Taylor, 2014). Icelandic importers can not import meat unless it has gone through various examinations and been frozen for at least 30 days. Frozen meat is of course not fresh and therefor are no imports on fresh meat allowed. Now lets use the tools of economics to see how this affects consumers, producers and the economic welfare. The demand is rather inelastic as explained earlier. We assume that the supply is close to unit elastic due to various factors pulling in either direction. The world supply on the other hand is elastic since it is a very large competitive market. We will keep these assumptions about elasticity’s out this chapter. To simplify, impact of taxation is ignored. Figure 1 shows current status on Icelandic fresh meat market. 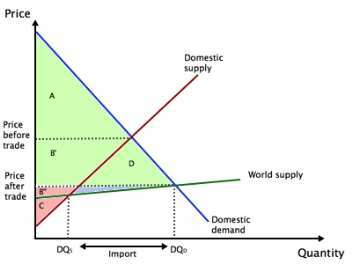 No fresh meat is bought from foreign suppliers and consumer surplus (green) is the area A and producers surplus (red) is the area B+C. Now lets see what happens if Icelandic government relieves the import restrictions on fresh meat. Figure 2 shows that consumer surplus gains a lot and equals the area A+B’+D while producer’s surplus reduces (B-B’=B’’) and equals the area C+B’’. The price falls and since the domestic quantity supplied (DQS) is less than the domestic quantity demanded (DQD) the difference has to be imported. 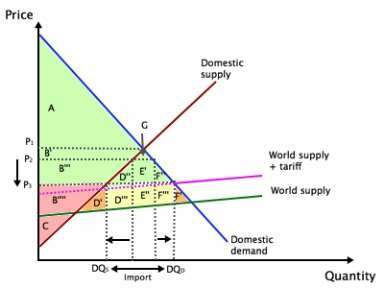 Figure 2 does not shows what would happen in current situation because of import tariffs and import quotas. The import tariff on meat from nations within EU and EFTA is 18% and 30% from other nations. Nations with in EU are allowed to import to Iceland limited amount (tariff-quota) of pork, poultry and beef (no lamb) with out tariff . On the other hand, the Import quotas are sold to the highest bidder leading to little or no gain from the free trade to the importer (Icelandic Federation of Labour, 2007). To get the idea of how things might be if the restrictions were relieved we look at the meat market in general, including frozen and processed meat. In 2010 the market share of imported meat was 3%, which is a very small percentage (Icelandic Competition Authority, 2012). The high tariffs and quotas keep the import level at a minimum. 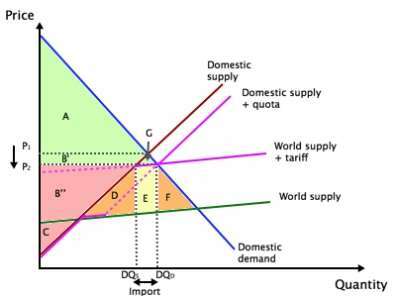 Figure 3 shows how the market is with tariff and quota, assuming for simplicity that they cross the domestic demand at the same quantity. The area for consumer surplus has now increased, from what we saw in figure 1, by area B’+G and producer surplus has decreased by area B’. The government revenue (yellow), area E, is added since there is tariff added to the world supply and quotas sold. The deadweight loss (orange), or loss to society, from this tariff and quota is area D+F. The price falls slightly from P1 to P2, domestic quantity demanded increases and domestic quantity supplied decreases. Meat has to be imported to meet the demand from DQS to DQD (it is likely that the ratio of import is much smaller than indicated in figure 3 compared to current 3% import market share). We can see by comparing figure 3 to figure 1 that both government and consumers gain surplus while producers are worse off resulting in total surplus change of area +G+E (table 1). This infers that removing restrictions will raise the economic wellbeing. Import restrictions are not the only thing that the Icelandic Consumer Organization and others want to be taken action on. As mentioned before high tariffs and quotas keep the imports of meat at a minimum. It is not cost efficient to import fresh meat and therefore the tariff income on fresh meat to the Icelandic government is not substantial. In a report the Icelandic Statistical Bureau published in 2006 about reasons for high food prices in Iceland it was indicated that if tariffs would be reduced by half on main agriculture products the income loss for the government would be 145 million ISK, but on the other hand the rise in income due to increased turnover would be 900 million ISK (Snorrason, 2006). Now lets assume that import quotas will be removed and import tariffs lowered as shown in figure 4. Figure 4: If Restrictions and Quotas were Relieved as well as Tariff Reduction. The price consumers pay will fall from P2 to P3. Domestic quantity supplied will decrease and domestic demand will increase leading in larger import. Table 2 shows the changes of reducing import tariffs and removing quota. The total change in total surplus will be the area +D’’+F’’+D’’’+F’’’. The total surplus change from figure 1 to figure 4 is then the area G+E+D’’+F’’+D’’’+F’’’. This area is the measure off how much the market increases it’s welfare. There are always losers and winners in trade. In this case the producers would always be the looser since import tariffs and quotas are always to protect the domestic producers. Consumers and the government are winners in this case with lower price to consumers and increased revenue for the Government. The Government could then use that revenue to increase subsidizes to the domestic production to keep up their competitiveness to the world market. What would Icelandic consumers gain if import restriction where relieved. The Consumer Protection Agency argues that because of the poor status of the Icelandic currency ISK and current tariffs the Icelandic producers have nothing to fear. When import restrictions on tomatoes, cucumbers and peppers from Europe where relieved in 2002 some predicted that domestic production would stop. The outcome was on the other hand that prices of these goods decreased, domestic production increased and producers gained more profit. This will be the case for fresh meat as well. Supply and variety of meat will increase and consumers will have better alternatives (Icelandic Consumer Organisation, 2013). Tariff protection does not protect the agriculture producers but gives shelter for high price on competitive and substitution goods. The impact of reducing tariff protection would have a big impact on the agriculture producers and some might not be able to compete with the world market. Therefore it would be important to support the agriculture producers by increased subsidizes and other operations optimizing while lowering tariffs (Snorrason, 2006). The impact of relieving import restrictions on fresh meat and lowering tariffs on meat in general could lead to Iceland being dependent on foreign market concerning food security. Foreign markets might face shock to their production, such as animal disease or crop failure and would that lead to shortage and/or significant price change for Icelanders at least in the short run (Jóhannesson T. , 2004). In economics there is a principle that says that people respond to incentives. The consumer knows what he wants when two or more alternatives are available, he is consistent in the way that if he choses product A rather than B and product B rather than C, that he will then choose A rather than C. He also chooses more quantity of quality rather than less quantity of quality, for example he chooses three apples instead of two apples if the price is the same. Most people are though aware that they can consume less that they desire because their spending is constrained, or limited, by their income (Mankiw & Taylor, 2014). In reality this is not so simple as indicated above. The experience of Finland and Sweden joining the European union (free trade) showed that consumers are willing to pay higher prices for domestic produced goods compared to similar imported goods. In the case of Icelandic vegetables, Icelanders are willing to pay 10% more than for imported vegetables (Kristófersson & Bjarnadóttir, 2011). Research has shown that 62% of Icelandic consumers think Icelandic meat is of more quality that foreign meat, 26% would pay 6%-10% higher price for Icelandic meat and 21% would pay 11-15% higher price. When consumers where asked if they would rather buy foreign cheaper meat, 35% said yes, 45% no and 20% where undecided (Þórhallsdóttir, 2012). These numbers indicate that if import restrictions where relieved or reduced then Icelandic producers of meat have to step up and show their advantages to consumers to keep their loyalty. For example show their proximity to the market, production methods, quality and nutrition level (Þórhallsdóttir, 2012). The world is always getting smaller and smaller with globalization and increased trade. The pressure on Icelandic government to reduce restrictions on importing fresh meat will only increase by time. If the Icelandic government cannot prove that import of raw meat harms the health of humans and animals they will have to reduce import restriction from countries with in EU. Icelandic farmers and producers of meat need to prepare for the market opening up by promoting them self among consumers and differentiate. All restriction reduction on import including quotas and tariffs benefit the consumers, it’s just a matter of how much. Increased competition could also lead to production improvement with in the meat farmers/producers and increase their turnover and profit like the vegetable industry experienced. Since the coverage on changes in economic welfare in this paper were only theoretical it would be interesting to see a research report on the real influences in numbers, similar to the report of the Statistical Bureau in 2006 about food prices. Icelandic Competition Authority. (2012). Verðþróun og samkeppni á dagvörumarkaði [Price developments & competition on convenience market]. Reykjavík: Icelandic Competition Authority. Jóhannesson, S., & Agnarsson, S. (2004). Bónid er bústólpi, bú er landstólpi [Farmer is the man of the house, a farm is a pillar of the commuity]. University of Iceland, Institute of Economics. Reykjavík: Oddi hf. Jóhannesson, T. (2004). Framleiðslukerfi í búfjárrækt [Production system for livestock raising]. Education conference of the agriculture industry (pp. 55-60). Reykjavík: Iclandic Farmers Association. Kristófersson, D. M., & Bjarnadóttir, E. (2011). Staða íslenks landbúnaðar gagnvart aðild að Evrópusambandinu [Icelands agruculture status towards membership of the European Union]. Mankiw, N. G., & Taylor, M. P. (2014). Economics. Andover: Cengage Learning . Snorrason, H. (2006). Skýrsla formanns nefndar sem forsætisráðherra skipaði 16. janúar 2006 til þess að fjalla um helstu orsakaþætti hás matarverðs á Íslandi og gera tillögur sem miða að því að færa matvælaverð nær því sem gegnur og gerist í nágrannaríkjunum [Report from the presitend of a committe that was nominated 16th of January 2006 by the prime minister to adress the main triggers to high food price in Iceland and make a suggestion to bring food price down to same level as in neighbouring countries]. Reykjavík: Icelandic Statistical Bureau. Þorgeirsson, S., Bjarnadóttir, E., & Sveinsson, Þ. E. (2004). Atvinnuvegur á krossgötum – Staða búgreina á breyttum tímum [Industry on crossroads – Farming position in different times]. Education conference of the agriculture industry (pp. 61-73). Reykjavík: Iclandic Farmers Association. Þórhallsdóttir, S. A. (2012). Viðhorf íslenskra neytenda til landbúnaðarframleiðslu – Áhrifaþættir í kjötneyslu- [Icelandic consumers attitude towards agricutlure products – Factors influencing meat cunsumption -]. Agricultural University of Iceland, Natural Resources Department. Reykjavík: Agricultural University of Iceland. "Impact of Meat Import Restrictions." UKEssays.com. 11 2018. All Answers Ltd. 04 2019 <https://www.ukessays.com/essays/economics/impact-restrictions-meat-imports-8664.php?vref=1>. "Impact of Meat Import Restrictions." All Answers Ltd. ukessays.com, November 2018. Web. 23 April 2019. <https://www.ukessays.com/essays/economics/impact-restrictions-meat-imports-8664.php?vref=1>. UKEssays. November 2018. Impact of Meat Import Restrictions. [online]. Available from: https://www.ukessays.com/essays/economics/impact-restrictions-meat-imports-8664.php?vref=1 [Accessed 23 April 2019]. UKEssays. Impact of Meat Import Restrictions [Internet]. November 2018. [Accessed 23 April 2019]; Available from: https://www.ukessays.com/essays/economics/impact-restrictions-meat-imports-8664.php?vref=1.